Females Usually Live Longer than Males… Right? After the 1918 flu epidemic, Women’s life expectancy has risen steadily. In fact, Women’s life expectancy has risen and stayed above men’s, creating an age gap of about 4-5 years. What are the reasons that women tend to live longer then men? Theories suggest that it could be due to the fact that men work at more dangerous jobs, are more likely to fight in wars, and some even suggest it could be because men often avoid seeing a doctor more than women or women have a more advantageous biological makeup. Luckily for males, the age gap is closing, and their life expectancy is increasing. It is projected that by 2035, men will close the life expectancy gap with females. The reasons for the increase in life expectancy is due to the improvement in safety in the work space and how women are taking on more of the dangerous jobs. For example. there is less of a mortality risk for men when in a career such as mining or being a soldier and women have taken more of the responsibility of these jobs, therefore sharing the risks. Yet, the close in the life expectancy gap is not completely because of males. Unfortunately for women, mainly American Women, their life expectancy’s have began to decrease. As of now, the drop in life expectancy for American women has affected about 12% of the U.S. women population. Of the 12%, most women lived in rural areas and had low-incomes. Figure 1 shows the areas where women have been recorded to die earlier than the average American woman. The colors represent change in life expectancy from 1987 – 2007. As Figure 1 represents, the American women life expectancy rate has mainly decreased by 1.1-2.5 years across the country. 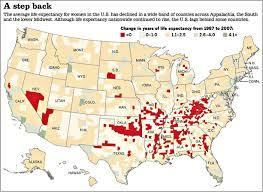 So why has American women’s life expectancy decreased? In the 1,000 counties that recorded women who had a low life expectancy, a lot of the early deaths seemed to be related to the increase of diabetes, lung cancer, emphysema, and kidney failure among women. Yet what do these health problems all have in common? They all are long-term consequences of smoking. Women started smoking more casually and consistently much later then men did, therefore women are facing these consequences later. Researchers have also found evidence that the increasing issue of obesity in America also affects the decrease in American women’s life expectancy. 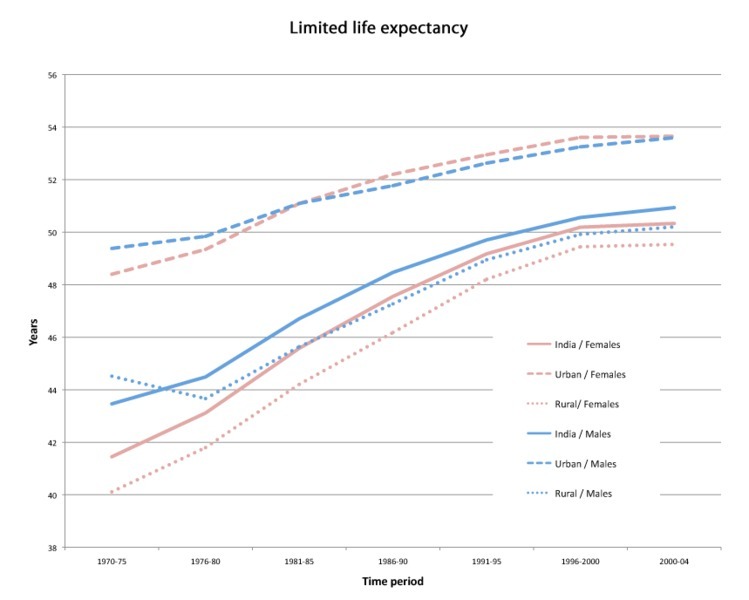 In Figure 2, Urban/males (blue, fragmented line) and urban/females ((red, fragmented line) represents how over time the gap between males and females is decreasing, both with male’s life expectancy increasing and women’s life expectancy decreasing. Out of all the deaths in America, both male and female, about half are due to life-style choices or environmental causes. Yet a lot of these deaths can be avoided through personal actions such as quitting smoking, drinking alcohol, eating healthy, and exercising more often. Through these adjustments, people will live longer, and instead male’s life expectancy increasing and women’s life expectancy decreasing, both male’s and female’s life expectancies can be increasing.. Very interesting, I was not aware that the gap between life expectancies of men and women is closing. I wonder if this same trend is occurring in other parts of the globe besides the United States and in which countries. Would a country with a demographic makeup different than that of the United States show the same trend? If not, what factors are preventing the gap between life expectancies from closing? I like how you went into detail about how women’s life expectancies were largely due to social norms set up for women traditionally. It’s interesting to see how much of the hard, scientific data we’re studying is related or even due to social justice issues. We’ve already seen that educating and empowering women can help drop fertility rates. Now you’ve pointed out that women joining the stereotypical “male” jobs (such as the military) and moving more into the public sphere (marked by the rise in smoking) has impacted their life expectancies. It just goes to show how important it is to help the public understand environmental issues, since they really aren’t just important to science, but to social and gender studies and public health as well. I like how you brought up the biological argument. What if women biologically lived longer than males? Say that the life styles of men and women where equal. Will the data still show that there is no age gap? In theory, a women’s body physically goes through a remarkable transformation while creating a child. Would this factor effect the age gap if at both males and females had similar lifestyles? I would predict that due to this uneasy process of birth, the life span of the average women may decrease due to the enormous amount of stress on the body. The female body under goes significant changes that the male body will never experience. Without having to bear child, this might cause men to live longer. Could this factor unbalance the scale? Would it ever be possible for the age gap between the life spans of males and females to be nonexistent? Kristin, I think that it is very interesting that the gap between the life expectancy for men and women is beginning to close. I liked how you pointed out that the reason the gap is closing is because of both ends and not just one, meaning that the life expectancy is increasing for men, while it is decreasing for women. I understand the reasons why it is decreasing for women, however I was a bit confused as to why the life expectancy was increasing for me. You suggest that it is because men are in less strenuous careers and because less people are at war. My one question to you is, if a male and female had identical lifestyles, will there be anything that biologically sets them apart allowing one gender to live longer than the other? Is there something that sets women apart genetically, that will always make them have a higher life expectancy than men? Another funny thing is that men are stronger than women, however they live longer. If a man and a woman both had the same disease, will the women still have a better chance of living and fighting through the disease than them man? This topic really intrigued me and I think you did a fantastic job tying the ends together.